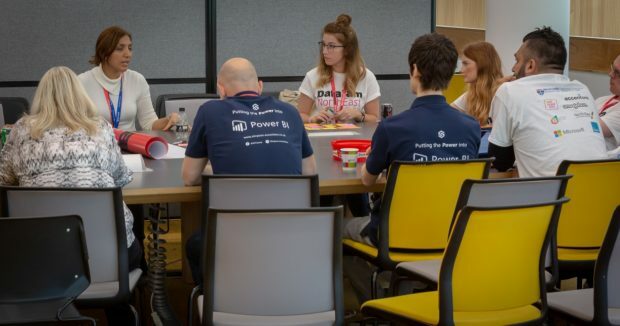 At DataJam North East in Newcastle on September 17 /18, DWP Digital was part of 50 organisations from across government and the digital industry that came together to use the power of data and service design to help come up with solutions to issues affecting the North East region. Stephen Southern, Data Science Platform Lead at DWP Digital reflects on the event and its legacy. I’m a big advocate of the One Team Gov movement which aims to reform the public sector through practical actions. When my DWP Digital colleagues Ryan Dunn and Celine McLoughlin proposed creating an event in Newcastle based on the One Team Gov principles with practical action at the core, I jumped at the chance to get involved. 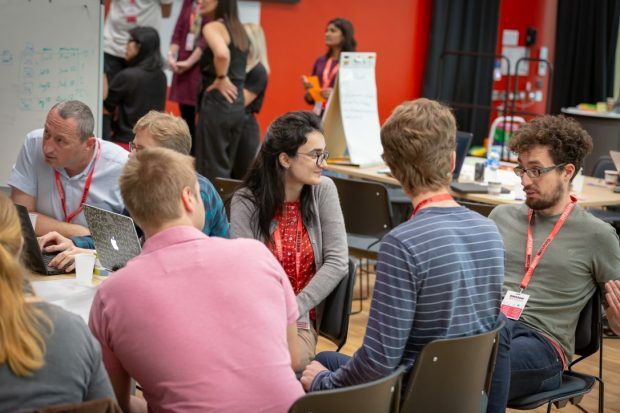 After initial discussions with numerous public, private and academic partner organisations across the region the idea was formed to run an event that combined a technical hackathon (hack), unconference and workshops running across two days. The event would bring policy, service design and data people under one roof; using real data sets and service design expertise to answer some of the problems affecting our region in terms of four main areas of focus - health, skills, education and innovation. Running an event that combined all three elements of a hack, unconference and workshops would be ambitious, logistically difficult and a little scary. I’m a Data Science Platform Lead at DWP so my area of interest was the hack. I teamed up with Ste Hext, my counterpart at Newcastle City Council, to design and deliver this. Indeed, collaboration was going on across all the partner organisations in the hectic run-up to DataJam North East. From information delegates gave us when they registered, we matched teams based on the predefined problem statements we developed. Working with a team of solution architects provided by Microsoft, we designed and built a platform that would allow the hack teams to access a central ‘data lake’ pre-filled with data on these main DataJam themes, which was provided by various councils, Nexus (who run the Tyne & Wear Metro) and ourselves at DWP. 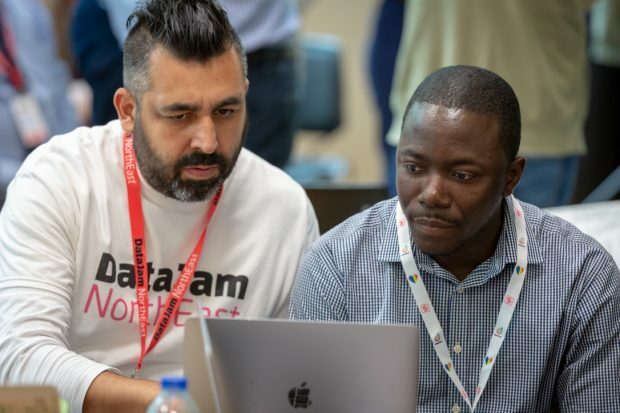 After all the preparation, it was a great feeling to get the hack up and running on day one of DataJam North East. 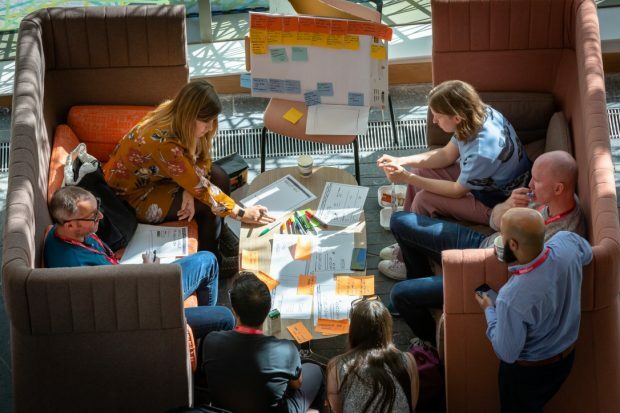 A hack combining technical skills and service design expertise is unusual and it took a little bit of time for the service designers, policy experts and data professionals to figure out how to best work together. But the join up between all three areas was clear as the event progressed and the ideas flowed. Indeed, the highlight of the event for me was seeing these teams work together over the two days, and to see the possibilities offered by having more than just data people in the room. I attended some of the unconference sessions throughout the event too, and to hear the conversations around user needs and the focus on outcomes and making a difference, it was truly inspirational. Everyone was passionate about making a difference in the region which was brilliant to see. It was also good for delegates to learn something new with workshops on things like Microsoft’s Power BI data visualisation tool. What became really clear seeing the final show and tells was that DataJam North East is just the start of something. 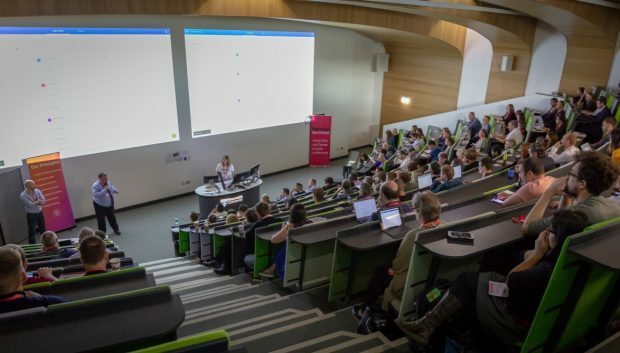 Many of the attendees were strangers on the Monday morning but by Tuesday afternoon they were friends who had shared, collaborated and worked together to make DataJam North East such an amazing event. One such example of many was seeing people from organisations as diverse as Tyne and Wear Fire Service and the Urban Observatory connect at the event and share data that will hopefully make a difference in terms of reduced emergency response times. Our hope is that these sort of conversations and collaborations continue and DataJam North East spawns many further micro actions. If you want to get involved in the DataJam North East data and service design community email the DataJam team or search #DataJamNE on Twitter. Watch a short video of the event with organisers and delegates talking about how DataJam North East brought data and service design together at the event.